While the Doctor and Charley are drawn into the murky world of nineteenth-century politics, C’rizz struggles to maintain his dignity against growing odds. What begins as an attempt to prevent murder quickly becomes a desperate race to avert revolution. Separated from the TARDIS, the travellers are left to wonder if they’ll get their own lives back or be forever entangled with the lives of others. 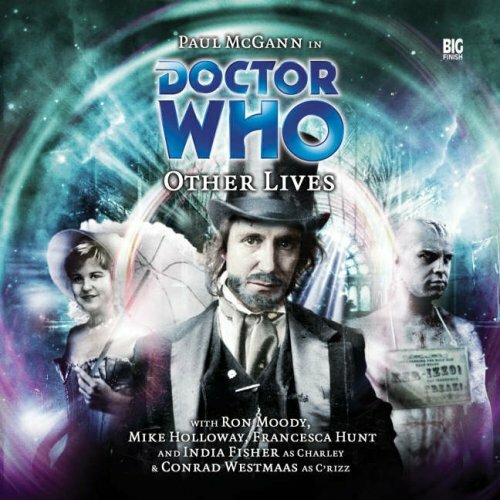 Paul McGann is the Doctor in Other Lives. Separating the Doctor and his companions is a time-honored tradition for Doctor Who. Kidnappings, being jailed, doors closing, panels sliding shut, grabbing a random rope hanging from the sky, or just a general sense of curiosity; if it can keep the Doctor and the companions apart for most of an episode, the writers will do it. Doing so, while cliché, can easily add a sense of drama and tension, as well as relief when the pair are reunited. It can also add double the danger, double the exposition, and double the plotlines, for good or for ill.
Other Lives separates the Eighth Doctor, Charley, and C’rizz early on, each one experiencing their own story as they all find themselves portraying someone they’re not. The script mixes light-hearted humor, social class commentary, and a Dickensian-style case of mistaken identity with a hint of political intrigue. While the main cast and secondary characters all get their moments, the overall story suffers from a lack of urgency that fails to make the situations the main cast find themselves in hold any dramatic water. Charley has always wanted to see the Great Exhibition of the Works of Industry of All Nations at the grand Crystal Palace in London, 1851. The Doctor agrees to take her, but this means C’Rizz would have to stay inside the TARDIS and observe through a scanner, since Victorian London (“Dogs and Chinese stay off the grass”) isn’t quite ready for an alien. What should be a grand tour of mankind’s most ingenious works takes a sudden turn, as the Doctor and Charley are separated, Charley convinces C’rizz to cover up and leave the TARDIS to help find the Doctor, and two French diplomats hide in the TARDIS to escape an assassin’s bullet…and the TARDIS decides that the best way to protect them is to dematerialize! This leads to the Doctor being thrown out of the Crystal Palace and becoming reliant on the kindness of a woman who insists he’s her long lost husband, C’rizz being captured by a sideshow barker to take part in his display of freaks in Picadilly Circus, and Charley being mistaken for a prostitute before being thrown into the world of counter-revolutionary politics at the side of none other than the Duke of Wellington! …though, I have to say. Rufus Dimplesqueeze? Really? That sounds like a child’s imaginary friend, not a Dickensian character! We go from “Charlotte Pollard, Edwardian Adventuress” to “Charley, Victorian Tart/Harlot/Strumpet/Street Walker/Adventuress.” Much like McGann, I enjoyed India Fisher in this story because, after a string of bland performances, Fisher sounds like she’s having a blast. Whether it’s being kicked out of the Great Exhibition, mistaken for a prostitute by Mr. Dimplesqueeze (sigh…), being forced to impersonate a French diplomat despite having no command of the French language, or simply fangirling out at the sight of her personal hero, the Duke of Wellington (or, as she calls him, Arthur, to which the Duke’s beleaguered boduguard, Fazackerly, always responds with the proper title), Fisher is just flat out having fun with the part. She worries about the Doctor and C’rizz, of course, but for the first time in a long time, Charley is actually enjoying the best part of being a Doctor’s companion; seeing new things and meeting new people brought about by throwing herself into a new situation. Even though the actual storyline doesn’t go very far, I’m willing to overlook it, as Charley’s parts in Other Lives made me smile. That’s the highest praise I can recall giving a Charley storyline in a year or so! …wait, hold on. I’ve just been handed a letter. Please don’t make me type it. I won’t! I won’t! I won’t! I won’t! I won’t! …Rufus Dimplesqueeze, loud, crass, and wanting only the best for himself, whether its Charley’s “company” or Georgina’s house. He’s fine for the part, I just didn’t care for the role. Sleazeball? Fine. Sleazeball buying the Doctor is Georgina’s husband after the Doctor almost flummoxed it up? A bit too convenient for my taste. And speaking of Ms. Georgina Marlow, aka Francesca Hunt, aka Hannah Barthlomew, future Fifth Doctor companion, aka India Fisher’s step-sister, she is in solid form early in her time with Big Finish. She’s desperate to find her husband, not just because she loves him and misses him, but with him gone, Uncle Rufus Dimplesqueeze (SON OF A MOTHERLESS!) will have claim to her home, turning her and her children out into the street. It’s a nice, understated moment about women in Victorian England, and one can see with Hunt’s quiet, desperate performance, done without going over the top or into melodrama just how badly she wants the Doctor to be her husband, and even though the Doctor knows it wrong and repeatedly says so, there’s something to McGann’s performance that you could imagine the Doctor, sans TARDIS, settling down, if only for a moment, and how desperate Georgina is to grab on to that thin thread and hang on for all she’s worth. Gary Russell and David Darlington deserve credit for bringing 1851 London to life in a grand manner as well with all kinds of sounds and backdrops, from the huge crowds at the expedition to the straw mats of Crackle’s jail cell to the empty house of Georgina Marlow. Other Lives, however, suffers from a lack of urgency to its proceedings. There’s plenty going on, with diplomats vanishing, the TARDIS dematerializing, revolutionaries on the loose, a wife about to lose her home, a sentient being in a freakshow against his will, but at no point is there really any sense of “what’s going to happen next?” Some have made the case that this serial harkens back to the William Hartnell days, with a focus more on the historical setting than any science fiction plot. That still doesn’t mean that the story doesn’t meander its way from point to point. The only show of real urgency is when the Duke of Wellington raises his voice (and even then, is he really worried about the French bringing a revolution to England’s shores, or just being an old man with Napoleon isseus?) or C’rizz gets angry during the sideshow. Even the ending is like “oh, the TARDIS is back, the day is saved, hey, here’s your sappy happy conclusion.” The performances are great, but the way the story unfolds just doesn’t give them the dramatic weight they should have. Quibbles aside, you can tell I had fun writing this review, because it’s great to actually hear a decent Eighth Doctor story and the cast enjoying themselves. A vast improvement over Terror Firma and Scaredy Cat, Other Lives is worth a listen, especially if you’ve suffered through those two stories, because it’s such a needed breath of fresh air for Eight, Charley, and C’rizz, as well as Paul, India, and Conrad. Other Lives is a story whose details might be forgotten soon after a listen. But if you can keep your focus as the plot vaguely saunters from one scene to another, taking its sweet time, then this is the story for you, as you can sit back and enjoy the performances at your (and the plot’s) leisure. This entry was posted in Big Finish Review and tagged 3/5, Big Finish, Big Finish Audio, Big Finish Review, C'rizz, Charley Pollard, Conrad Westmaas, Doctor Who, Doctor Who Audio, Doctor Who Review, Eighth Doctor, India Fisher, paul mcgann, TARDIS. Bookmark the permalink.